Medical Technology, or MedTech, is becoming vital in Asia. The region’s growing population and economy are key factors driving the sector. While demand side factors might be fundamental to how it burgeons, innovation on the part of MedTech companies in response to current healthcare needs are key too. It is this latter clause which was the main pulse charted at this year’s Asia Pacific MedTech Forum. Four years in, the Forum brought together over 700 healthcare leaders, the largest and most diverse to date. Appropriately themed ‘Technology in Healthcare: Empowering Patients; Driving Outcomes’, panellists at the sessions continued to drive home the point that MedTech innovations should be patient and clinician centric. Speaking at a plenary titled, “How can MedTechs help hospitals drive better outcomes?”, were Caroline Riady (Managing Director, Siloam Hospitals), Gautam Khanna, (Chief Executive Officer, P.D. Hinduja Hospital & MRC, Mumbai), and Chew Kwee Tiang (Chief Executive Officer, Khoo Teck Puat Hospital and Yishun Health), and Allan Yeo (Principal Advisor, Healthcare, Deal Advisory, ASPAC, KPMG). 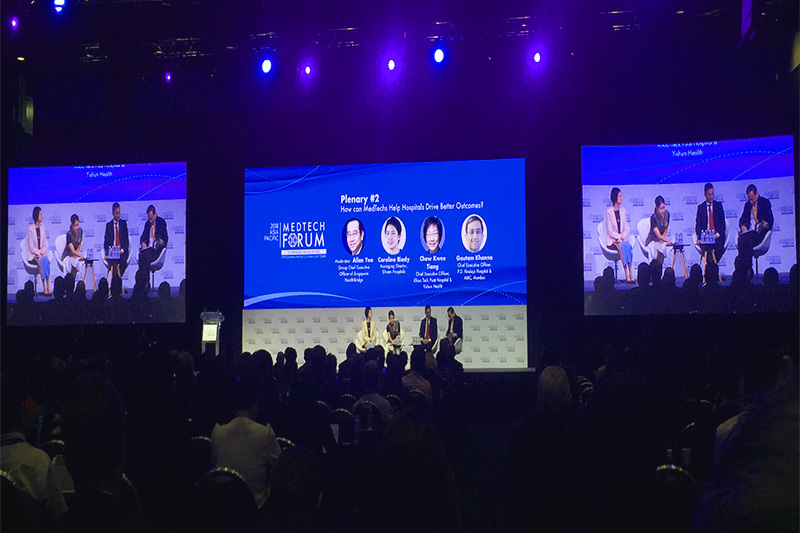 The regional perspectives offered by each shed light on the unique struggles each region faces and where MedTech companies can play a supporting role. Riady shared her experience working in Indonesia’s hospitals. In a country where impeccable logistics have yet to be realised, MedTech companies can be of great assistance. Citing the positive example of radiology centres around the country, hospitals still lacked radiologists to interpret and relay the information to patients. Coordinating the timing between radiologists was also a challenge. Teleradiology was the solution. The technology allowed images to be shared with more mature hospitals which are well-staffed and host better equipment. Although this solution was a good stopgap measure, not all MedTech solutions are perfect. A telemedicine device which picks, bags and stores medications was implemented to overcome operational inefficiencies and improve patient safety. The machine delivered on its promise, however it could only accommodate a limited number of items and only hard foil packaged drugs. Indonesia largely dispenses drugs in soft foil packaging. Moreover, human effort remained mandatory to remember prescriptions. Change management was a hurdle to cross in the adoption of MedTech. Chew shared similar pain points. Relatively new, Khoo Teck Puat Hospital had the opportunity to build its facilities from scratch. While the dream was to acquire technologies, which improve operations and facilitate rehabilitation, Chew soon realised that they were at the bottom of the food chain in terms of what suppliers wanted to provide. Secondly, not all the solutions MedTech vendors supplied were a good fit for the operating environment. Robots in healthcare might be all the buzz. Unfortunately, whether the robot can interface with the building is often overlooked. Furthermore, public hospitals might not be able to afford the underlying technologies such as real time location setup. Simpler, albeit older, technology such as an automated guided vehicle still serves current needs sufficiently well. Miles away in India, hospitals face a different set of challenges. Khanna shared that acquiring the latest technologies might not be high up on the agenda for public hospitals in India. As much embracing MedTech would be exciting, hospitals are seriously hindered by its cost and a large enough talent pool. The market needs to pay careful attention to realities on the ground instead of hard selling flashy technologies. An area which could do with additional help are providing affordable care to more people outside the hospital; at home and in smaller clinics. The dynamism of the region suggests that no MedTech solution is panacea. Where MedTech companies can value add are in the expertise they have acquired from other healthcare institutions. The invitation to partner on innovations are still open, according to the panellists. However, this is the bottom line: Hospitals aren’t just looking for fancy gadgets and gizmos. MedTech vendors need to be the solution and walk the path alongside clinicians. This means understanding the needs of patients, clinicians and the unique operational challenges of a hospital. The equipment should oversee the entire continuum of care; from admission to rehabilitation, to deliver a MedTech product that simply cannot be refused.